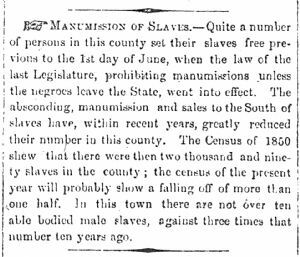 Quite a number of persons in this county set their slaves free previous to the 1st day of June, when the law of the last Legislature, prohibiting manumissions unless the negroes leave the State, went into effect. The absconding, manumission and sales to the South of slaves have, within recent years, greatly reduced their number in this county. The Census of 1850 show that there were then two thousand and ninety slaves in the county; the census of the present year will probably show a falling off of more than one half. In this town there are not over ten able bodied male slaves, against three times that number ten years ago.